View More In Tea Ball Strainers. Brew your favorite loose leaf tea, like Gunpowder Green Tea, in minutes. Simply place the tea in your infuser, set the tea steeper in your mug, pour hot water into the infuser, and let steep for 2-3 minutes depending on your tea variety. Placing the lid on unit during brewing will minimize any heat loss, and produce lovely consistent cups of tea every time. Say good-bye to debris in your tea forever! 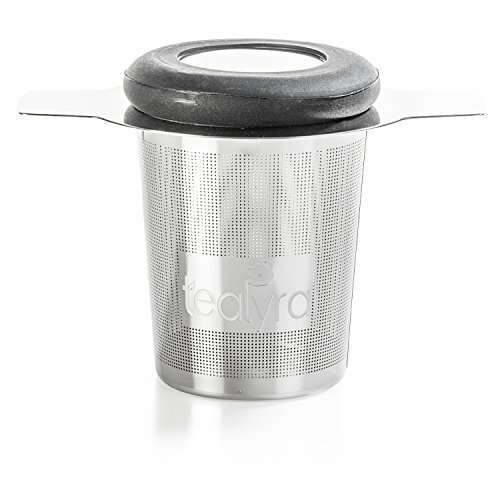 The 304 stainless steel mesh is extra fine, so it keeps tea leaves out of your drink. No extra filters or tea bags are needed. Unit holds approximately 20 teaspoons worth of loose leaf tea. Great for brewing one cup, or a full pot. Made from eco-friendly rust resistant 304 stainless steel, this is the only tea strainer you will need. This single cup infuser is lead and chemical free. A lid comes with your purchase to keep the tea hot while brewing. Flip the lid over and use it as a drip tray when the tea filter is pulled out of the mug to keep you counter clean. The heat resistant silicone handles of the infuser will sit on the rim of your mug, making it easy to remove with no worries of heat related injuries. This infuser is perfect for brewing fruits and fine loose tea such as Rooibos, Oolong, Pu-Erh, Yerba Mate, Herbal, Teavana & Starbucks teas. Make sure the material being steeped is larger than the mesh filter. When brewing coffee, pour the water in slowly. A paper filter is recommended to keep the finer grounds out, but by using course grinds, you allow the coffee oils to pass freely into your cup for maximum benefits. PREMIUM 304 (18/8) STAINLESS STEEL - Made from the highest Eco friendly quality, all food grade stainless steel, RUST RESISTANT and DISHWASHER SAFE. PERFECT SIZE - tea infuser basket fits mugs with openings between 2.25-4 inches and which are at least 2.34 inches high. So it fits most standard cups or mugs or even small teapots. Tea strainer is NOT intended for wide-mouth mugs. EASY CLEAN AND CARE- This tea infuser has a lid that doubles as a drip tray so you do not make a mess all over your table. This infuser is also dishwasher safe and can be easily cleaned in less than 15 seconds. IDEAL GIFT IDEA - for everyone who likes tea. Very practical tea infuser made of Premium High Quality 304 Stainless steel, Lead-free, Built to Last. If you have any questions about this product by Tealyra, contact us by completing and submitting the form below. If you are looking for a specif part number, please include it with your message.